1.) To edit general settings of this plugin, go to settings under the plugin tab. 2.) 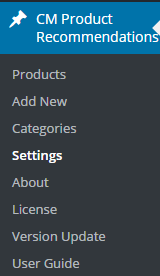 Click on the general settings tab. 3.) Here you can change where the product recommendations appear. Choose whether you want product recommendations on single posts or pages or want them displayed on every page. You can also choose whether a recommendation appears only at the first occurrence of the keyword. To learn more about this feature you can also refer to the CM Tooltip Glossary General Settings.